Miami Criminal Defense Lawyer Bijan Sebastian Parwaresch is a Former Prosecutor (Division Chief) who has been handling only criminal cases for the past 20 years. He gained a thorough understanding of all three sides of the criminal justice system by having interned with a Federal Judge, prosecuted a wide variety of criminal cases as a distinguished Miami Prosecutor and defended thousands of criminal accusations. Attorney Parwaresch knows the law, he knows the system and he knows how to get the best results for his clients. In all Criminal Cases, strict court procedure applies in all instances. The prosecutor, your adversary, will prepare for your case. Being investigated, arrested or prosecuted can be a terrifying and upsetting experience. Suddenly, you find your self in a world you never thought you would experience. A criminal case can effect many things like liberty, job opportunity, immigration status and family harmony. Immediate intervention, negotiation and guidance by an experienced criminal defense lawyer is your best option. In his years of practice, attorney Bijan Parwaresch has gained a high level of trial experience, which, combined with an aggressive enthusiasm to fight for the criminally accused , will help you get through this situation. Personal conviction, experience, channeled aggression and full disclosure to the client are the foundation of his practice. When you have been charged with a crime, you want to be sure that your rights are fully protected in the best way possible. Mr. Parwaresch is dedicated to providing each and every client with the level of defense that they require and deserve. After you have been arrested, it is in your best interest to have a powerful and connected advocate in your corner. 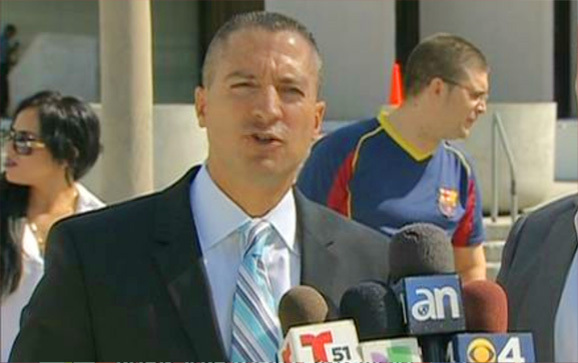 Attorney Bijan Sebastian Parwaresch is one of Miami's premiere Criminal Defense Attorneys. He will personally handle every case. 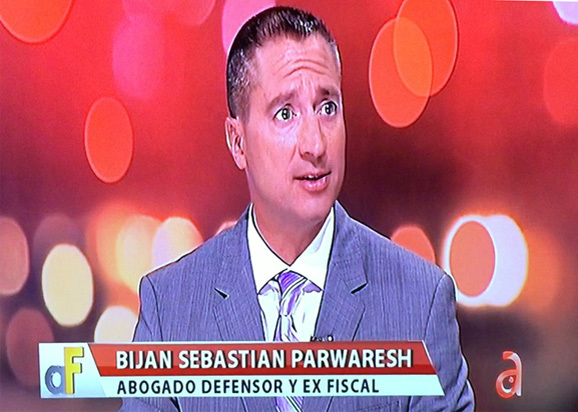 Although the team at the Law Office of Bijan Parwaresch includes other former Prosecutors who assist in research and writing and bilingual Paralegals (expert legal assistants), Bijan Sebastian Parwaresch will be consulting you at every stage of the investigation and the criminal Court case. As a client you will have phone access to Mr. Parwaresch 24 hours a day. At this firm it is understood what type of pressure a criminal case brings with it. You will always be informed about the status of your case and will be represented competently throughout the proceedings. Attorney Parwaresch handles both State Court and Federal Court cases. Comprehensive and cutting edge representation distinguishes Mr. Parwaresch. As a member of virtually every specialized criminal defense organization in the United States and constantly being involved in international criminal cases, affords attorney Parwaresch the opportunity to be up to date on the most innovative forensic defense strategies. Whether it be the latest DNA testing of Narcotics or the most recent update of the criminal section of the Tax code, Mr. Parwaresch is updated in all areas of Criminal Law and has the right expert witnesses at hand. There is no question that you require immediate criminal defense representation if law enforcement is moving forward against you, but picking the correct lawyer for your situation is the more complicated decision. Criminal Defense lawyer Bijan Sebastian Parwaresch will be your best choice based on 19 years of criminal law specialization, an intricate understanding of the system and an outstanding proven track record of getting results for his clients. 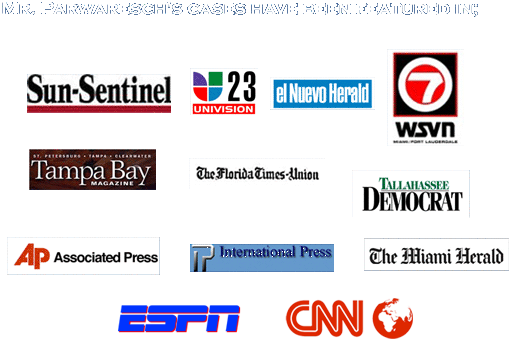 Call or email Mr. Parwaresch today for a free case analysis and a suggested course of action to solve your problem. Copyright © 2011, Law Offices of Bijan Parwaresch, P.A.